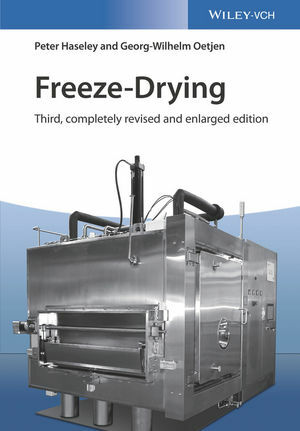 This completely updated and enlarged third edition of the classic text adopts a practical approach to describe the fundamentals of freeze-drying, backed by many explanatory examples. Following an introduction to the fundamentals, the book goes on to discuss process and plant automation as well as methods to transfer pilot plant qualifications and process data to production. An entire section is devoted to a large range of different pharmaceutical, biological, and medical products. New to this edition are chapters on antibodies, freeze-dry microscopy, TEMPRIS, microwave freeze-drying, spray freeze-drying, and PAT. Their many years of experience in freeze-drying enable the authors to supply valuable criteria for the selection of laboratory, pilot and production plants, discussing the advantages, drawbacks and limitations of different plant designs. Alongside guidelines for the evaluation and qualification of plants and processes, the author also includes a troubleshooting section. Dipl. Ing. Peter Haseley is an independent consultant for lyophilization technology incl. process and cycle development with an expertise in freeze-drying of ODT (oral fast dissolving tablets), the development and design study for an semi-continuous working lyophilization plants, the transfer of Freeze-Drying cycles from an Usifroid plant to a Telstar plant, cycle development and process optimization and the standardization of projects for costs reduction and fast track component production. He worked already together with Dr. Georg-Wilhelm Oetjen (who passed away 2015) on the second edition of ?Freeze-Drying? and has now taken over the authorship for the third edition.